ALL CONTENT PROTECTED UNDER THE DIGITAL MILLENNIUM COPYRIGHT ACT.CONTENT THEFT, EITHER PRINT OR ELECTRONIC, IS A FEDERAL OFFENSE. **Please don’t copy recipes or photos to your blog or website without my permission (see above). Discussing recipes and linking to the original full recipe on SouthernPlate.com is fine. Thank you for your consideration and for helping me pay the light bill by not taking content. Thank you! I’m no longer receiving your emails, what can I do? I heard you had a previous cookbook, where can I get that? I want to meet you! are you coming to my town? Why aren’t you coming to my town? I write a blog and want to feature one of your recipes, how do I go about doing that legally? Can you donate a book/Southern Plate merchandise to our ______? Do you have a recipe for ______? I love your recipes! Do I have to print out all of the pictures to get them, though? I want to start a blog. Can I email you with questions and ask for advice? I’m going out of town, can you hold my emails? I’m having problems viewing your website, what did you do to it? I’m looking for a particular recipe that you emailed a few weeks ago, can you email it to me again? Do you ever post light or low sugar recipes on your site? However, those are not the only ones on the site, I’m always adding more! Where do all of your recipes come from? I can’t find Self Rising/White Lily flour, what can I do? Do you accept advertising/offer reviews/want to try a product? I bet your kitchen is fabulous! how big is it/what does it look like? Can you do anything other than cook? What are your plans for Southern Plate? From time to time different internet service providers go down right as I send an email and it is returned as undeliverable. When this happens twice, my email program puts those email addresses on an inactive list. The solution is simple, though, just go to https://www.southernplate.com/subscribe and subcribe again to get your emails coming once more :). If this isn’t the problem, please check your spam/junk folder and make sure christy @ southernplate.com and contact @ southernplate.com are approved addresses. Please note that these addresses receive hundreds of emails per day and I’m afraid I simply don’t have time to respond to each one. 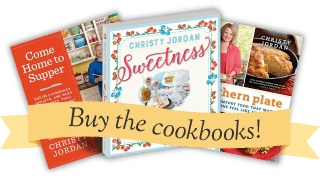 My cookbook, Southern Plate: Classic Comfort Food That Makes Everyone Feel Like Family , is available in all major bookstores and online retailers now! My book features over 150 time honored family recipes, as well as the story behind them. Some very special stories from my heart and home to yours are featured as well. I know you’ll also enjoy the beautiful photos of food and family! Unfortunately, it is no longer available. I self published it and my mother was so happy when I got the deal for the BIG book because she didn’t have to go to the post office every day to mail out cookbooks herself. ~grins~ I owe her bigtime for that and so much more! I promise I don’t have any of these books left and still get daily emails asking about it. I know you will enjoy my new book, though, and hope you’ll pick up a copy! Please don’t send money via paypal or postal service for copies of the cookbook. Purchase directly from a bookseller. I want to meet you! Are you coming to my town? I just finished up a big old book tour. I’ve never traveled that much in my entire life and as much as I loved getting to meet the Southern Plate Family, I definitely didn’t enjoy being away from my kids. I’m a Mama, I’m supposed to be Mama-ing. I do travel from time to time for speaking engagements or short appearance trips so be sure and check out my Facebook Events page to see if something near you is coming up. Also, check out where all I’ve been because I feel like a real world traveler! Click here to see my entire book tour travel listing as well as where I’m headed next. If the stars ever align, I’d dearly love to meet you, too! Why aren’t you coming to my town? Can’t you come? I would dearly love to come to each town but I have to personally pay for any travel beyond my book tour. I am a stay at home mom and it’s very difficult to arrange child care and then foot the bill to travel on my own. If an invitation is issued and expenses are covered, I’d be happy to come provided it does not present a problem for my family or interfere with their schedules. Please understand that we’re just a family like any other and can’t take money out of our family budget for things like this. This is something that personally tugs at my heart with guilt every time someone is upset that I’m not coming to their town. I do wish I could make everyone happy but my family will always come first. I know you wouldn’t have it any other way though and I know you can see how it would be were you in my shoes. That’s why I love ya! Thank you so much, what an honor for me! Due to the Digital Media Copyright Act of 1998, there are certain regulations about reproducing digital content from the internet. I’d love for you to link to me but doing it properly ensures that both your blog and mine don’t suffer any ill reprocussions. If you would like to show one of my recipes on your blog, your own pictures and insights on the recipe can certainly be used, as well as brief quotes from my post, but please link to SouthernPlate.com for the full recipe rather than put it on your blog. This is much better for you and me in the long haul. I dearly love to help out whenever I can. However, I am currently receiving ten or more requests like this each week and simply don’t have the funds to purchase and ship that many books (it would be hundreds and hundreds of dollars a month). I’m honored that you thought of me and would love to help in any other way if time and resources permit me to. Do you have a recipe for ______________? There are about five hundred recipes on SouthernPlate.com right now so chances are pretty good I do! Please use the search box in the top right of the page or browse through the index. Thank you! I love you reading my recipes! I’ve recently added a feature that makes each recipe print friendly, just click the “print this” button at the bottom. Please note: I have had to go back and hand code every single post in order to make it print friendly. With over five hundred posts, I missed a few. Your patience is greatly appreciated if you happen upon one of these. Feel free to copy and paste it in a word program in order to print or simply write down the recipe by hand until I can get to it. Due to the size of my subscriber list, I can’t go back and sift through my past emails to find the email to send you again. As an alternative, though, please use the search feature on Southern Plate and retrieve the recipe directly from the website. You might want to also check your email trash folder as it is still there unless it has been emptied. I’m no longer receiving emails from you. What can I do? I’m so sorry, I know this is frustrating. 99% of the time when this happens it is due to your email service marking Southern Plate emails as spam or junk. Please check those folders in your email system first. If you are still not receiving emails, try subscribing again at SouthernPlate.com/Subscribe . Once you have tried both of these (please do try the first option because that is almost always the problem), if you are still having problems you can email media @ Southernplate.com and we will help you as soon as we are able. Thank you for your understanding and for being a subscriber! I’m sorry, the email subscribership is automated and I am unable to go in and temporarily turn them off or resume them for one address. Nothing, honest. As the stepsister in EverAfter said, “I’m just here for the food.” My tech saviness extends only to the realm of minor maintenance and posting to Southern Plate. I really don’t have any bells and whistles beyond a plethora of photographs, which might cause the page to load slower on some computers. I do have a large pool of folks check my site periodically from various computers in addition to checking in with tech friends to make sure everything is still running normally and that Southern Plate doesn’t require anything out of the ordinary in order to be viewed. If you continue to have problems, please check to make sure you are using the latest version of your internet browser. I highly recommend Mozilla Firefox as an internet browser and according to my site stats, over eighty percent of my readers use Firefox as their main browser. It is free and can be downloaded here. If you are using Internet Explorer, you might want to try downloading Firefox as your browser. Internet Explorer is being phased out and even the creators are trying to get folks to stop using it due to it’s outdated nature. Most often, when folks are having trouble viewing Southern Plate, they are using Internet Explorer. 2. I’m on a budget. Actually, many of the desserts and such on my site are ones which I make with splenda instead of sugar. Personally, I cannot have much sugar at all. However, I show sugar in my tutorials and then if I use Splenda instead, I mention that in the body of each post. You might want to check out this post where I highlight some of my past Splenda recipes. However, those are not the only ones on the site, I’m always adding more! Well, I do have a degree in Family and Consumer Sciences (Home Ec) and I love to cook. However, the brunt of my recipes come from my mother, my grandmothers, my great grandmothers, their great grandmothers, their great great grandmothers, their great, great, great grandmothers…. Kidding…well I mean that’s an option of course. If you can’t find White Lily, just get regular flour, it’ll be fine. If self rising is not available where you are, use this formula to make your own. *To make your own self rising flour, simply add 1 1/2 tsp baking powder and 1/2 tsp salt for EACH cup of all purpose flour. Sift ingredients well to make sure it is uniform. For information on any of these topics, please visit my Media Page by clicking here. My kitchen here at Bountiful is a dream come true! If you’d like a tour of it, click here. If, on the very off chance, I ever end up famous, I’m going to rent out a big old plantation house and have one heck of a picnic for all of y’all on the lawn! I’d just love to feed everyone and it’s always good to have a dream. YES!!! I am SO GLAD SOMEONE FINALLY ASKED THIS!!!!! (alright, maybe I pretended they asked). I can sing Row, Row, Row Your Boat…BACKWARDS!!!! Seriously! I also know every single word to “Modern Major General”! AND I can do this weird thing with my lip….OOH and I do the BEST Chicken dance you’ve ever seen! I want to make the world a better place. It may sound like a cheesy pipe dream, but I happen to think we could use more people with cheesy pipe dreams, don’t you? So sorry but you have gone and ruined the best food website EVER! When I went to the old site …regardless of what page I was on I was able to just run my curser over a picture and want to make it immediately! Now it is just text and none of your personality in the pages at all! What a diappointment the changes are. I could go to 100’s of websites If I wanted to just see an index staring at me. When I went to the old site I was inspired instantly! What I loved the most about your old site is the instant visuals and it was effortless to get to the recipe! I will not be recommending the site to anyone else… So sorry. May I please copy your recipe for Peanut Butter and milk granola bars?